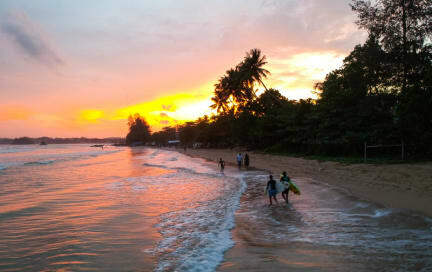 Come stay with us in beautiful Weligama, southern Sri Lankas surfer’s paradise! We are located directly at main surf beach with the ocean just a doorstep away. We offer comfy double rooms and dorms with ensuite / shared bathroom, a big community kitchen and a lot of places to relax and meet other travellers. Grab one of our bikes and explore the area, rent a SUP, join one of our yoga classes or simply watch the palmtrees- chilling in a hammock in our lush green garden. And did we mention the Hummus Bar? No? In our restaurant Hummus Bar you can indulge in the best Lebanese food - vegan, healthy and highly addictive ;-)!